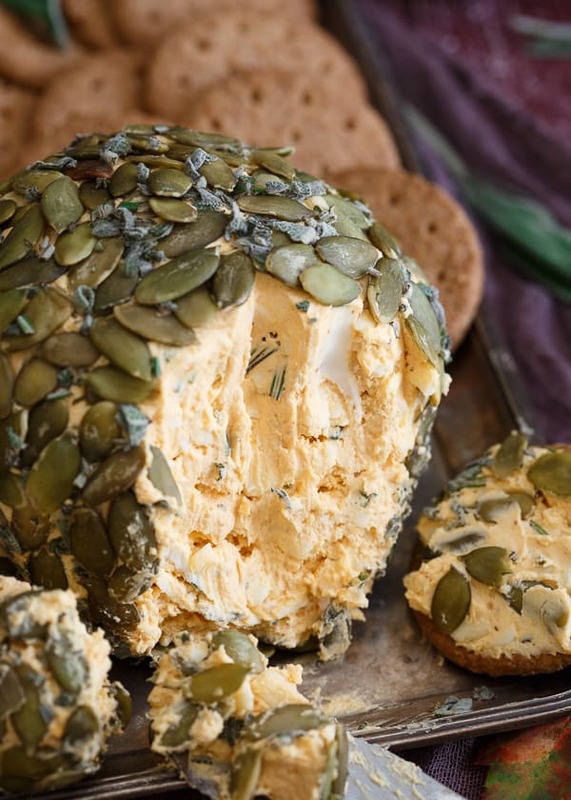 This pumpkin herb cheese ball is perfect for fall appetizer spreads. Throw an adult Halloween party and make sure this is on the menu! It probably all started with the handmade pumpkin costume my mother made me when I was 3 that was about 10 sizes too big and incredibly cumbersome to walk around trick-or-treating in, but Halloween has never been one of my favorite holidays. Weirdly, for someone who doesn’t get into any other holiday (and fights me every year on why we have to actually put a Christmas tree up), Ulysses loves Halloween. To the point which he made me save these horrendously cheesy plush M&M figurines dressed up in Star Wars costumes he brought home from work like 8 years ago when I was cleaning out our holiday decorations last year. They’re really the gaudiest decoration in existence for the holiday and they’re in my house. Last year, we left for vacation on Halloween afternoon so Ulys made me fill up the biggest bowl we had in the house with candy and leave it on the front steps for the neighborhood kids. A week later, we came home from North Carolina to find candy wrappers strewn about the front yard and a nice big “THANKS” spray painted on our driveway (which we had just paid $800 to have sealed). Almost a year later, “THANKS” (although a bit faded) still greets me every time I pull up the driveway. So, going forward I’ve basically decided to ignore the obnoxious doorbell ringing/driveway vandalizing kid part of the holiday and focus on the fun part that comes with being an adult, Halloween parties! When “diablo” is in your brand’s name, you pretty much have the market-share cornered for best Halloween wine, am I right? Casillero del Diablo Wines (translating to “wine cellar of the devil”) was one of the first Chilean wines to be sold in the U.S. and it’s Cabernet Sauvignon is the #1 imported wine in it’s price category ($8.99-$10.99). 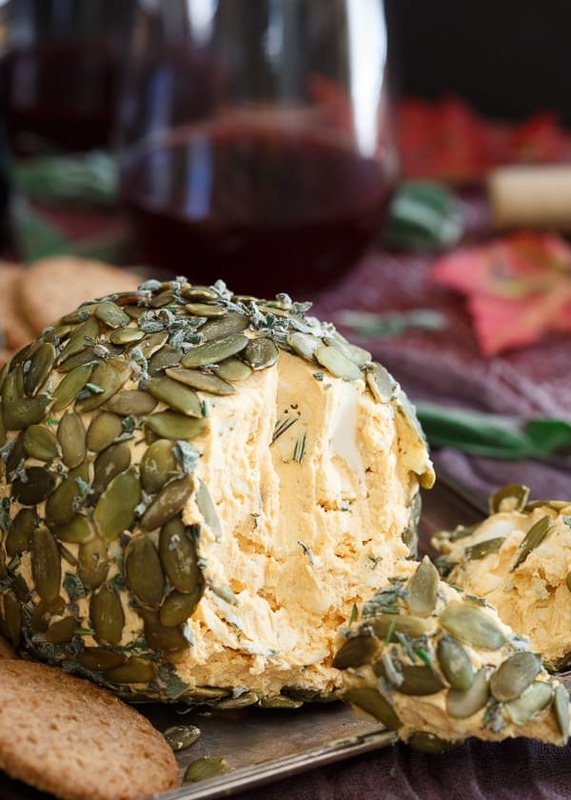 I can’t be the only one out there who would happily forego the cheesy spider web/scary monster/ghost inspired foods and rather kick back with the adults, a big glass of red in hand and some delicious appetizers that don’t resemble witches fingers, like this pumpkin herb cheese ball. If fall could be defined in appetizer form, it would be this pumpkin cheese ball. 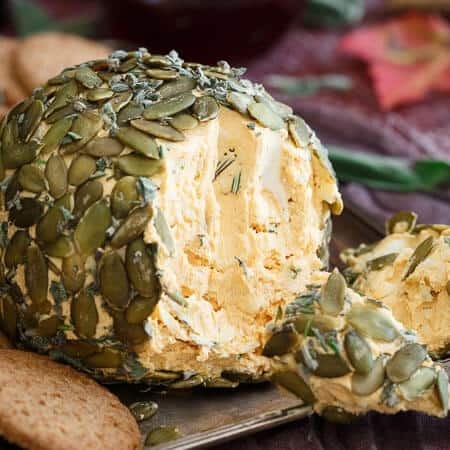 Filled with creamy mascarpone, cream cheese, cheddar, pumpkin and lots of fresh fall-like herbs before it’s rolled in pumpkin seeds and more herbs, this pumpkin herb cheese ball is the plate everyone will be hovering around. It’s incredibly simple to make and the perfect pairing with the cabernet. 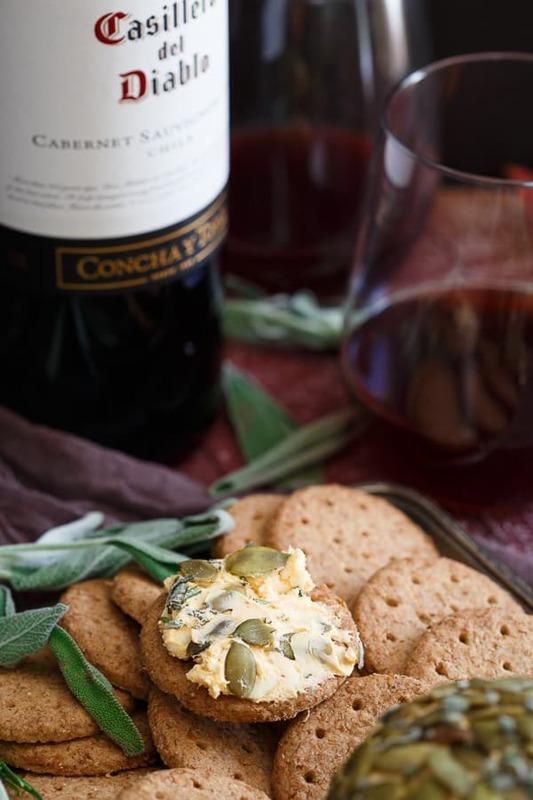 Deep reds, no matter the season, are always my favorite when it comes to wine but there’s something so perfect about crisp fall days, savory appetizers and a big pour of a chewy red wine. This cabernet is one that totally fits the bill on that description. Wine + cheese, that’s how you do Halloween. Let the kids have the Snickers, this one’s for the adults. Combine the cheeses and pumpkin in a stand mixer fitted with the paddle attachment. Add the herbs, salt and pepper and mix again until combined. Transfer the cheese mixture onto a large piece of plastic wrap and shape into a ball as best you can. Wrap up the cheese and place in the refrigerator for at least 30 minutes. Remove from refrigerator and reshape into a ball again. Now that the cheeses are hardened a bit it should be easier to shape. Place the pumpkin seeds and extra herbs on a plate. Roll the ball of cheese in the mixture and gently press down so that the seeds and herbs stick to the outside of the cheese ball. Keep wrapped in plastic and refrigerated until serving. Now this is a cheese ball that would please the crowd. Love that you rolled the cheese in pumpkin seeds. Sharing! That cheese ball looks SO good! My daughter loves that wine, I need to get around to trying it. Looks so good and your photos are absolutely gorgeous! Ummm that’s horrible! I would be LIVID, and yes, would definitely forgo the giving of the candy for that moment until eternity. Ha. Now, this cheese ball….Who DOESN’T love a good cheese ball, and I love love love that you went the savory route with the pumpkin! I am so not in to Halloween. My husband is forcing me to dress up this year. I told him I’d buy a pair of cat ears; lame, I know. Yeah, I’m the ba humbug in the neighborhood who turns off all my lights and takes cover in the basement until it’s over. I think I’ll make this here cheese ball to take with me to the basement for snacking. Pinned. This cheese ball made my mouth water!!!!! 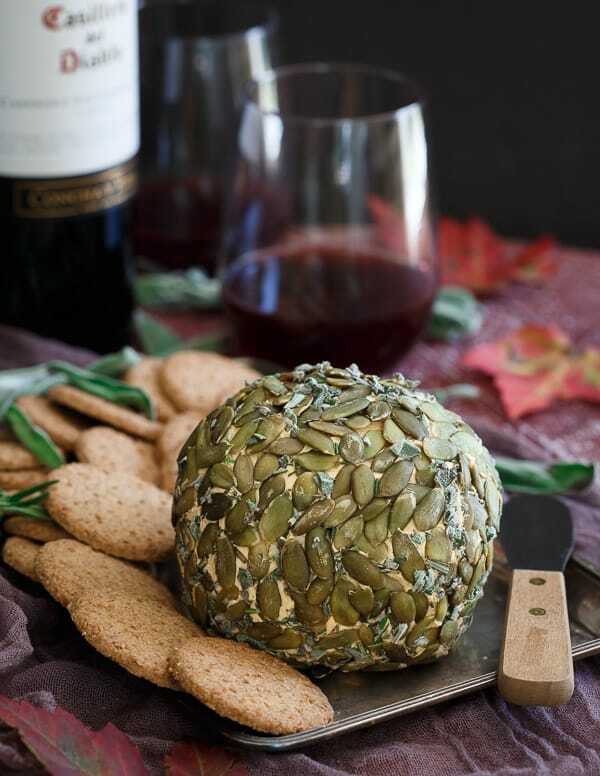 This cheese ball sounds so good and looks beautiful — perfect for a fall party. we have a lot of renters in our neighborhood so I am with you about not giving out candy! I got sick of the mean kids who demanded candy even though they were too old. Not cool about the driveway!! UGH! I like to celebrate with friends and family, wathcing football and enjoying good food! Like this cheeseball!! FUN! I love the pepitas on the outside! I save the candy for my kid’s classes and thier lunchboxes! Or a midnight snack for me when I remove all the milky ways from their bags first. I would love to serve this cheese ball for Friendsgiving…what type of crackers did you serve with it? Almost looks like gingersnaps? This looks amazing! Is there any way around using cream cheese? If you like goat cheese, you could prob sub that. I would probably do 4-6 ounces of goat cheese and 2-4 ounces more mascarpone though since goat cheese has a much stronger flavor than cream cheese.